With features like an oversized swim platform, huge transom storage locker, an expansive cockpit and unique spiral staircase, Carver's 400 Cockpit Motor Yacht is designed for pure comfort and convenience. Topside, the 400's bridge includes seating for six, full instrumentation and plenty of storage. 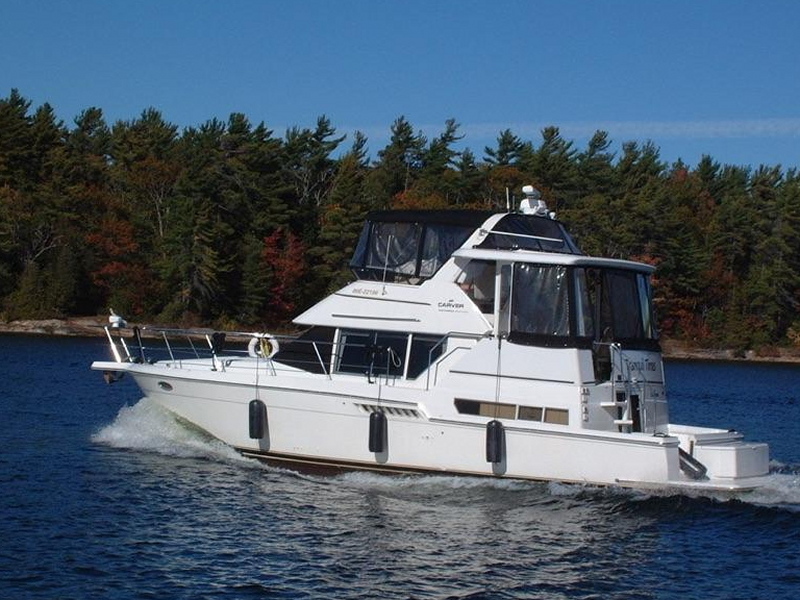 A few steps down, the entertainment-ready aft deck with wet bar and icemaker provides an ideal site for an evening of entertaining or a relaxing sunny cruise. Below deck, there is sleeping accommodation for six, including a convertible dinette, forward stateroom, and a master stateroom aft offering direct access to the cockpit, plus a complete galley, and two head compartments, each with a shower. This 400 CMY is equipped with the optional Cummins diesel engines offering great performance and fuel economy. A terrific cruising package offered at a very aggressive price point.